Are you Force Feeding your Child? But in the process of bringing up our children and ensuring that they have a good health, we often forget that eating food is different — very different. It involves taste, texture, appetite, temperament, listening and trust. It’s not about making or tricking a child eat what’s in front of them, but creating the circumstances that will help a child eat well not just today but all though their life. After all, the way we feed our children imprints their eating habits for years, at times, all through their lives. Are you a force feeding parent? Undoubtedly, as a parent, it’s your first duty to feed your child. But the majority of us take this too seriously and make it our life’s mission to ensure the child lick-cleans the plate in front of us. For most moms that’s the only way to be satisfied about complete nutritional intake by their child. 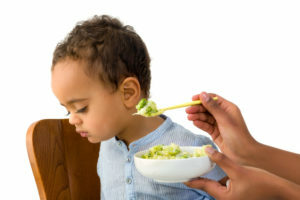 While it is worrisome when you place a plate full of food in front of your child and if she refuses to eat or eats few bites, but a lot of parents go overboard in their anxiety and end up force feeding their child. A range of emotions trigger parents during meal times, and while the central part of these emotions is worry (that the child will be hungry), it stems from the love we have for them. If you resort to these methods often, the end result of meal time must be an exhausted & irritated you and an unhappy and upset child. Forcing kids to eat, especially food that they don’t like, has longterm ill-effects. Saying “just one more bite” might seem harmless, but actually does more damage to a child than you realize. When a parent ends up force feeding the child, mostly unintentionally, the effects of the same can be extremely harmful. Child fails to understand his own body’s hunger cues. After being told to eat more than they wanted, overeating becomes the new normal! This destroys the child’s natural appetite. By consistent ignorance of child’s inner voice to stop eating, they start over-eating, often leading to weight-related issues later. This in turn affects the child psychologically and can manifest in the future as issues like lack of confidence, low self esteem; Often children develop feelings of hatred towards food. Eating disorders like anorexia or bulimia develop when children grow up. Since children are not allowed to have control on what they eat, they lack good self-regulation. Children, do not eat much, naturally. A child can eat less than half calories of what adults eat. Unless your child is suffering from any feeding disorder, she knows how much and when to eat. So do not over expect! One tip to get started is pick up feeding bowls or plates or even tiffin boxes that are meant for kids and not adults. You can add a few pretend play toys (like kitchen set or tea set or pretend picnic/camping) and make it a more engaging two-way activity where the child is equally involved. Kids generally have a liking towards finger food like baked veggie sticks, granola bar etc. This would ensure regular intake of all necessary nutrients and daily calorie intake. With small tummies, kids prefer eating small portion size as compared to a bowl full. So offer meals at regular intervals, however keep the portions small. Make meal time a family activity. Eat with your child. Display healthy eating habits as kids tend to imitate their parents behaviour. Incorporate a wide variety of foods in your meals, taste every new vegetable or fruit, introduce the concept of self-serving (if kids are over 3 years old). It is important for the child to know that they have the “right” to decide what and how much they want to eat. As parents, your anxiousness towards your child’s nutrition intake is natural. The fact is, whether we like it or not, children eat when they’re hungry and eat until they’re full. Rather we are all born with a natural regulator that sends signals to the brain to alert them when we’re hungry, thirsty and full. So instead of worrying about the quantity of meals, invest time and effort in the quality of food your child is eating. As a parent you can (and must) make a choice of offering healthy, nutritious food to your child but it’s not your responsibility to decide how much they eat at every meal. Only your child can tell you – if you let them listen to their own body – if they are hungry and when they are full. Trust your child here!